and other matters, starting from the North Coast of California. 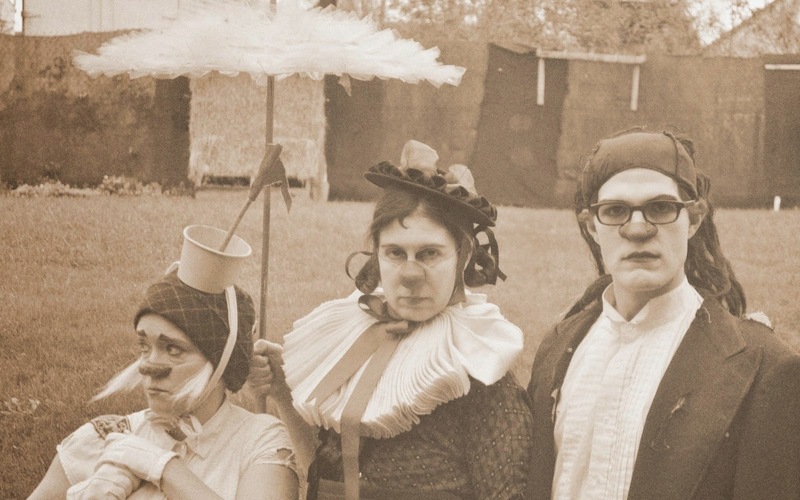 When she was an undergrad at Dell’Arte International, Lauren Wilson liked to clown around with fellow students Joe Krienke and Stephanie Thompson. Ten years later they find themselves back at Dell’Arte, this time as teachers. But it turns out they’re still clowns. So a decade after they put on the red noses and performed together, they’re back with a new Dell’Arte show they’ve also written called Three Trees, beginning its second and final weekend in the Carlo Theatre tonight (Jan. 27.) It’s not for children. In early 20th century Russia, two clowns called Bim and Bom had a routine called “The Laugh,” which is described in an article by Joel Schechter in Theater Magazine. According to a Russian novel (The Iron Flood), this particular routine almost stopped the Russian Revolution of 1917, when Red Army troops were paralyzed with laughter. A version of it is at the center of Three Trees, as is this premise of clowns who stop an army and are punished for it. This is the delicate form called a clown play, in which the clowns are characters—in this case, we see them preparing as well as performing routines. In the performance I saw opening night, these three clown actors each defined delightful characters, and they worked together with ease and grace. Stephanie Thompson plays a ditzy and endearing clown, sweet and sincere but tirelessly disorganized and clueless. Joe Krienke’s clown is almost introverted, a bit detached, yet mercurial and versatile—at one point, he’s two characters fighting each other. In the movies he’d be played by Johnny Depp. Lauren Wilson’s clown is dressed as a little girl and speaks with a little girl’s voice, but she’s also the mom that keeps them together and on track, and the only one with a sense of an external reality, a “real world” with its dangers, which in this case includes war in an unnamed country or time. She’s Alice in Wonderland as Mother Courage. The rehearsals and routines we see are accompanied at times by distant explosions that get louder and presumably closer. Eventually the clowns perform a rude routine about an army general, for the nearest available audience: soldiers. But laughter brings the war to a temporary halt, so for this—as well as being disrespectful to military authority—the clowns must face the consequences. The gags are well executed, and the use of props is inventive and adept. But don’t expect the central gag-- “The Laugh”--to be the funniest, most clever routine you’ve ever heard. With “three trees” as its punch line, it is meant to illustrate the power and mystery of contagious laughter, apparently over nothing. The primary thematic ideas seem to be about the role of laughter in war and circumstances of oppression. Laughter threatens pretensions that make war possible, and therefore it has to be suppressed. Laughter is also the ultimate refuge in really bad circumstances, and perhaps more—perhaps an assertion of humanity. Though elements of story as well as some striking images support these not altogether novel ideas, to be more powerful they might need to be more strongly expressed and integrated into the action. Still, especially given today’s reticence which confuses criticizing militarism with condemning the military, they are points worth introducing again. A secondary theme is that maleness causes warmaking. Popular as sexual politics when it was a new idea that the world would be more peaceful if women were in charge, it seems dubious as a primary explanation in the era of women generals and Sarah Palin. It does lead to the requisite bawdy jokes, though. What’s currently on view in Three Trees is engaging, provocative, challenging and entertaining. Above all, these intriguing characters and these three old friends clowning around are treats to see and savor. Ronlin Foreman is listed as “collaborator.” Daniel Spencer designed the set, Michael “Spike” Jackson the lighting.